A woman in her 90’s had her handbag stolen at a graveyard near Crumlin last Wednesday as she lay flowers at her sister’s grave who died just eight weeks ago. The woman had been attending the grave at St James’s Chapel in Aldergrove, and when she returned to her vehicle she discovered that someone had smashed the window of her car and stolen her handbag. The woman, who lives in Crumlin, had travelled just a few miles away from her home to the graveyard. When she stopped at the entrance, a male in a black car stopped briefly at first behind her, then parked his car in front of her vehicle. As she got out, she spoke briefly to the driver before she went into the graveyard to attend her sister’s grave. When she returned, just a few moments later, she was shocked to discover the window of her car had been smashed and her handbag and its contents had been taken. Mrs Kenndy said: “This man knew this woman was old, she’s tiny not even five feet tall, she was on her own and knew she was going to visit a loved one’s grave and he made the decision to break the car window and steal her handbag. How did he think she was going to feel? 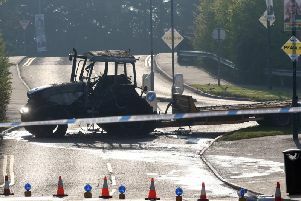 Local SDLP councillor Thomas Burns described the incident as “an absolute disgrace”.